Because of the many connectors, different drivers and software which are necessary to fully utilize a TV Tuner card, the installation takes a little longer than a video card. But it’s easily done, even for less experienced PC users. 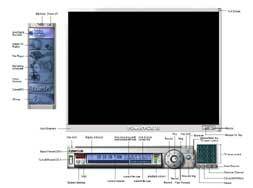 We first plugged in the card into one of the empty PCI slots, then connected the coaxial antenna cable to the rear bracket, connected the tuner card with the attached audio cable to the sound card, connected our Sony IP 220 digital video camera via the video connector box. After we found that that OS was properly recognizing the presence of the newly attached PCI device we installed the drivers from the CD and the bundle software. All this was done without any hiccups, and 30 minutes after we had taken the tuner card out of the box we could enjoy our first live PC TV broadcast. Later we stumbled onto a strange phenomenon: after rebooting, the system did still recognize the TV Tuner but did not start it. The system device manager told us: “device cannot start”. After reinstalling the card and the drivers it worked again. But after rebooting the tuner card was again not working. Suspecting an IRQ conflict with other PCI devices we rotated the card through all PCI slots always with the same result: after initially working, the tuner card could not be started after rebooting. After a while we found out that the drivers of our Highpoint 374 Raid controller were in conflict with the ASUS TV 880 PCI card. When using the ASUS 880 on the same PC with the OS installed on a single disk, we don’t experience this phenomenon. The driver for the HPT 374 is not WHQL certified, and we think they are to blame and not the tuner card. Whatever: we continued using the TV Tuner with a non-Raid system and did not experience any further problem. We found PowerVCR II 3.0 easy to handle and almost self-explanatory. The first step after installing is a “Program Auto Scan” to identify the available antenna and cable channels. 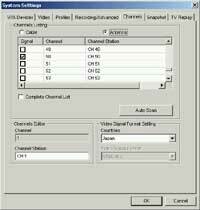 The desired channel is then selected for watching either directly by hitting the program number or by the multi-channel preview with 16 thumbnails of running programs. This and most other VCR functions are available via mouse or remote control. Watching TV can be done in 2 ways: as simple “TV live” watching or with the “Instant Replay” function enabled. In the later case the most recent portion of the broadcast - the length can be determined by the user- is recorded in a buffer on the hard disk. This way pausing of live broadcast and instant replay by rewinding is possible. 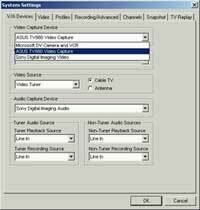 Recording TV broadcast and video stream from analog sources like VCR and analog video cameras with PowerVCR is easy: First the source is selected in system settings and then the compression medium and quality. The software offers several functions for enhancing the recording like noise reduction and smoothing, as well as timed and time-shifted recordings. If the later function is enabled you can watch a recorded program and then shift back to the beginning, without interrupting the recording process which is continuously running in the background. This is ideal to replay what has been missed during a bathroom break, and then shift back to the point in time when the replay was started and continue from there to watch the recorded video when at the same the running broadcast is further recorded. Naturally this process needs a lot of processing power and the frame rate goes down a little. 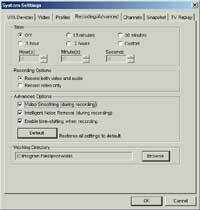 Power VCR has limited editing functionality: It’s possible to trim and merge recorded videos. More complex editing is possible with the bundled CyberLink’s Power Director 2.0. 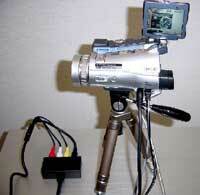 Power VCR has also digital (DV) camcorder support. That comes in handy for owners of digital video cameras with the Sony iLink or IEEE 1394 (FireWire) connectors. It allows playing DV files or encoding the contents as a pre-defined MPEG profile. It saves time and hard disk space by allowing to directly encoding DV files in MPEG format. Older programs need to encode in AVI format and then convert to MPEG afterwards. We could indeed capture and encode in MPEG from our SONY IP-220 digital video camera via the fast IEEE 1394 connection and even burn a CD with the attached software. We found though that with PowerVCR the capture/recording quality is better via S-video (through the TV Tuner card) than by USB streaming or via IEEE 1394. That seems to be a software/driver problem, because the propriety Sony Movishaker editing software that also captures via iLInk/IEEE 1394 (Firewire) delivers better visual quality than what we got with PowerVCR when recording by using USB or the DV (IEEE 1395) connection.